Start as we mean to go on ………. well that’s the plan!!!! So the first show of the season went as well as it could! It was Aigas of Achnacarry first show since HOYS and he made it a winning one at Nps area 7 RIHS qualifier in the 133cm workers also taking reserve champion. He’s such a dude and loves his job!! With my sister Vikki now back on board after having her baby I can now concentrate on my own rides for this season. Vikki has some really exciting novices as well as her open 14hh whp Gismo who will also contend the junior classes with Harrison Taylor. Just as Vikki has given birth to baby Isla Rose another surprise was sprung on us as our best friend and best unpaid groom Laura announced she’s also expecting!!!! At the worst possible time for her, right in the middle of RIHS week!!! 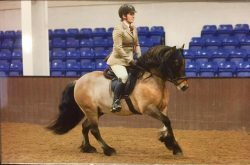 Good thing for me is that I now get the ride on her new beautiful fell stallion Hardendale Ray!! With a little rest till our next qualifier on 12th March it’s all go go go from then unless the other ponies pull their finger out so we can have an easy season!!! !